With some time off in the Admirals’ schedule, I thought it’d be fun to take a look some of the best and worst AHL jerseys of all time. Jerseys are just as historic as the teams that wear them and the AHL has put forth some of the sleekest and weakest offerings in sports history. When you bring up the topic of team attire everyone seems to have their own list of favorites and duds. We’d like to share some of our choices for the good, the bad and ugly and get some of yours as well. Today let’s take a look at the ugly. 1. Rockford pays a “tribute” to Mexican Heritage. You can call it picking on a rival, but it’s hard not to notice these duds the IceHogs donned last November on a themed Mexican heritage night. The color scheme offers a grim likeness of the early Phoenix Coyotes and in a world of increasing political correctness, the mustached Hog on the front might not fly with the easily offended. Note the K-mart logo on the top right. It’s fitting because this jersey looks like a cheap knock off that might be discovered on a K-mart clearance rack. On top of that, Smoky is far more intimidating than the cartoon bear in the middle. One can only speculate what could’ve inspired these tie-dye-like nightmares from Lake Erie. Hard to knock a celebration of the good ol’ red white and blue, but the Americans proved that in the wrong hands things can go a little over the top. 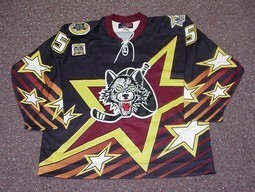 I wonder if people felt it disrespectful when these jerseys touched the ice. Do tell where this Lake EERIE is? I’m dying to know. I don’t know why, but the spelling of that place continues to elude me. I didn’t like the little sombreros on the big numbers for Rockford. I do like the Rochester jersey! @adsfan It’s a nice concept just a little to over the top for my taste. @Keithwozniak Did not know that. There’s some candidates for best jersey on that link. I hate those striped Amerks jerseys. That would be hard to sit through watching a team wear those for an entire year! 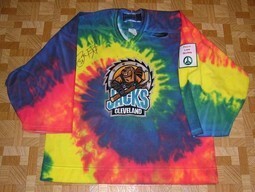 That Tie-Dye Lumberjacks one is wonderfully horrendous. Always felt the Danbury Trashers and San Diego Gulls had cool jerseys. In the Houston Aeros’ worst-ever loss on home ice (and worst lost period), they wore these. Dave Barr, Craig Fisher and the rest of the Orlando Solar Bears (95-96 season) pounded Houston 10-1 and were laughing at the last-place Aeros not only because of the score, but because the Aeros logo with the “Peace sign” was literally being torn off the cheap mesh by the middle of the second period. The early Rochester Americans jerseys were inspired by the New York Americans of the NHL. Those Amerks jerseys were certainly NOT hard to sit through. They wore them for the entire 95-96 season and won a Calder Cup in them. They’re pretty awesome jerseys. But as the earlier link showd, the Amerks have had many other even better designs. own Chinese restaurant in order to provide for his family.